The 2011 growing season was challenging on both coasts. Washington suffered a damaging freeze this past November. Oregon watched a cloudy summer drag the season out. And New York and Virginia watched storm after storm pound their vines all fall. Vineyard management was all-important no matter where you made wine. As for final quality in the bottle, it’s too early to know. But here’s a sneak peek. Finger Lakes vintners were put to the test in 2011, as the region dealt with its most difficult growing season in recent memory. With heavy rains falling from mid-August through harvest, New York’s upstate wine region struggled with disease pressures and uneven ripening that could result in a very inconsistent set of wines. As the first rains arrived in August, they came as a relief, helping vines recover. “We saw some good sugar accumulation through mid-September,” said Bell. But the rains continued persistently through September. “No year out here is easy, but this year really wasn’t easy,” said Richard Olsen-Harbich, describing the 2011 growing season on Long Island’s East End. Olsen-Harbich is winemaker at Bedell Cellars and has made wine on Long Island for more than 30 years. “We had a lot of rain, an earthquake. We also had a lot of heat.” Despite the challenges, the year was not as dire as some prior seasons. Most Long Island vintners believe that as long as they labored hard in the vineyards, they could make good wines this year. 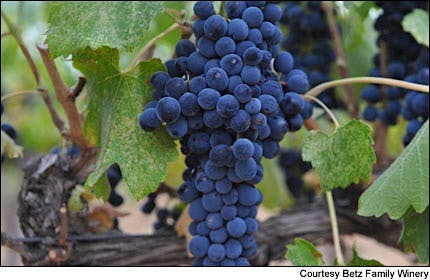 The earthquake that struck the East Coast in August did little harm to the grapes, but the rain was a bigger challenge. Hurricane Irene did most of her damage further west, dumping a little under 2 inches on the North Fork and the Hamptons. But the remnants of Tropical Storm Lee lumbered by two weeks later, bringing another 4 inches. All the wet weather raised the threat of mildew and botrytis. “The season was very challenging with all that rain,” said Roman Roth, winemaker at Wölffer Estate, Roanoke Vineyards and his own label, The Grapes of Roth. Cabernet Sauvignon grapes were ready for picking in Washington state. It was also a very warm growing season, one of the warmest on record, which increased the chances of fungus but also helped ripen the fruit. Roth reports that his red grapes’ tannins ripened quickly, allowing him to simply wait for sugars to catch up and pick when he wanted. He got to 22.5 Brix in his Merlot before a late-October frost forced the vines to drop their leaves and he sent out his pickers. 2010’s ideal weather helped Long Island produce very ripe, structured reds. This year, the weather produced more elegance. 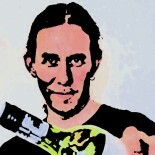 “The 2010 reds were more extracted,” said Olsen-Harbich. “We have more Mozart on the palate this year.” He was especially happy with his Cabernet Franc and Viognier. Roth said his Merlots were rich but should be approachable earlier than his 2010 Merlots. For four months, 2011 vintage looked like a disaster waiting to happen for Oregon vintners. The vines produced a huge crop and it didn’t look as if conditions would ever get warm enough to ripen it. It was, in the end, the latest vintage in Oregon history. Most wineries didn’t start picking until after Oct. 15, and were still picking in the first week in November. Most of the grapes were brought in under warm, sunny skies. Rain was forecast in late September and early October, but only a few showers materialized. Alcohols were low, about the same as in 2010, but color and flavor surprised vintners with their depth. They are calling it a miracle vintage. Harvesting bunches of Pinot Noir in Oregon’s Willamette Valley. Not only did the late fall weather save the vintage, vintners said, but it compared favourably with any vintage of the past 10 years. Harry Peterson-Nedry, proprietor of Chehalem Vineyards, compared it to 2008, 1999 and 1993. Others concurred. “I’m very encouraged by what we see, with very little water on anything, long hang times, low but adequate sugars for low alcohols, complete flavors and acids,” reported Peterson-Nedry. If Virginia winegrowers had to sum up 2011 in one word, they’d choose “wet.” This was a growing season that tried vineyard managers’ patience, as they tried to prevent mildew, botrytis and rot from destroying grapes before they could ripen. September and October brought storm after storm. Crates of grapes wait for the trip to the winery at Virginia’s Chrysalis Vineyards. The spring was warm and wet in most of Virginia’s wine regions, including the Monticello appellation near Charlottesville and the area near Middleburg farther north. Summer brought sunny, warm weather, with occasional rain. But the wet weather began when Hurricane Irene passed over the region in late August and the remnants of Tropical Storm Lee came just two weeks later. 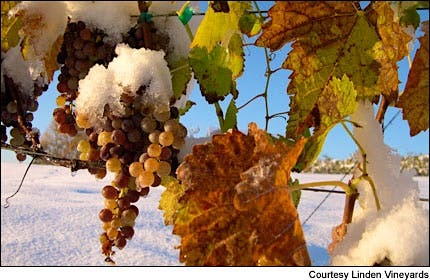 The defining event of Washington’s 2011 vintage occurred in 2010—a late-November freeze damaged vines across the state, particularly in the Horse Heaven Hills and Walla Walla appellations. A cool summer led to the latest harvest on record for many vintners. Despite alcohol levels slightly lower than normal, experienced vintners reported rich flavors. 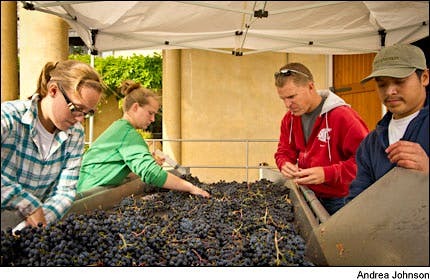 Careful grape sorting at Figgins Family Wines in Washington state. One grower, Hugh Shiels of DuBrul Vineyard in Yakima Valley, described his Cabernet Sauvignon as his most ageworthy Washington Cabernet ever. He credited cool ripening conditions after the grapes changed color, promoting flavor development while sugar accumulation was slow. 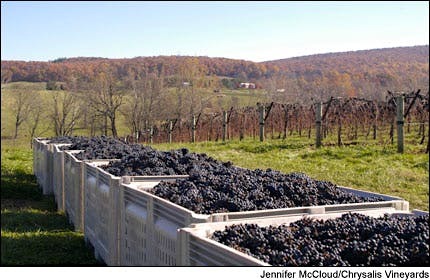 Last bunches of the season—grapes for ice wine hang at Linden Vineyards in Virginia. This entry was posted on November 21, 2011 by The Oenophiliac in News..